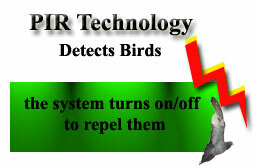 Find out if the ET Bird Control can repel your bird problem. D&R Technologies llc. Backs their ET Bird Control 2000 with a 60 day money back guarantee. Demand birds to leave specific areas safely, humanly and while keeping birds where you want them in the sky or trees close by! The ET Bird Control 2000 was made to eliminate bird problems. Those pesky birds that hang around your window sills, roofs, attics, warehouses can now be a thing of the past. Once properly positioned just flick on the switch and the ET Bird Control 2000 will go to work irritating most birds infestations to the max. ET Bird Control 2000 uses the latest technology such as PIR Detection, Intense Strobe Light Action and High Impact Ultrasonic Sounds as well as Bird Repelling Audible Sounds. * PIR detection: Turns on and off detecting birds in its path while conserving power consumption. * PIR = Passive Infrared Motion Detecting System. 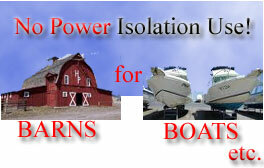 * Powered by two 9volt batteries: This feature is good for isolation use in areas such as barns, sheds, and places with out power. The ET Bird Control 2000 also can also can be plugged-in using the AC adaptor that also comes with. * Covers 915 square feet with-in a fan shape area. * Disturbing Strobe Light: Turns on upon Bird Detection. * High Impact Ultrasonic and audible bird repelling sounds. * Easy application shell: This shell allows you the ability to mount your ET 2000 just about any where you have a Bird Problem. * Bird Sound Confusion Switch: Keeps sounds fresh as well as gives sound bird repelling options for different situation. The ET Bird Control 2000 has a battery operation function that allows the unit to run off of 2 9volt batteries. This feature is great for places you do not have AC access (plug-in electricity). 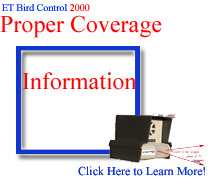 the ET Bird Control 2000 has to offer Click Here. Home | Contact | Return Policy | About Us | Application Guide | ET Bird Control 2000 Info. If you do not see your bird type please contact us here and we will give you the most up to date repelling information about the ET Bird Control 2000.